At this time of year, we seem to have more need to use metallic thread than any other time. If you find that you struggle with this thread type, try some of these solutions. When shopping for metallic thread, buy the largest spool you can afford. The larger the spool diameter, the better it will come off the spool, with fewer kinks and twists. Thread a needle with the metallic thread and pass the needle and thread through a styrofoam packing peanut. 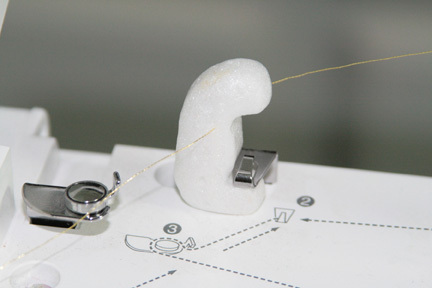 Place the peanut in the thread path, before the thread enters the tensioners. This removes all of the twists and makes the metallic thread performance improve almost magically! 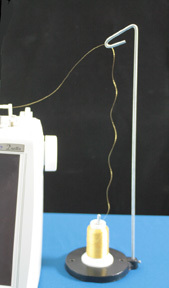 Use a needle that is specially designed for metallic threads. SulkyÒ suggests that a size 90/14 top stitch needle makes a good substitute if you do not have a metallic needle on hand. a top stitch needle also has a larger eye and deeper groove and could make a suitable substitute. 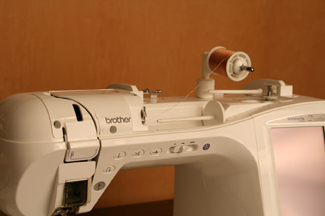 Place the thread spool on the vertical spool holder that is some distance from the machine to allow the twists and kinks to be reduced before entering the thread path. Another option is a spool holder that allows the thread to come from the spool in the same way as line from a fishing reel. This helps reduce kinks or twists. For best results, avoid designs with very short stitches, or a lot of tiny twists and turns. Metallic thread is a stiffer thread type and doesn't bend as easily as regular embroidery thread. Loosen your top tension, if necessary, to reduce thread breaks or shredding. If thread breaks persist, examine the thread path for rough spots. Be sure to inspect the presser foot and throat plate. Use moderate machine speed, if adjustable. Use only enough stabilizer to support your project. Forcing this delicate thread through unnecessary layers of stabilizer could contribute to friction thread breaks or shredding. Avoid the use of adhesives in the embroidery process if possible. I have been having issues with metallic thread that I don't even bother using them. But I shall try the tips you've provided. Thank you.